We were up at 6:00 this morning and it was still cloudy, with misting rain at times. Temperature was 43. It never really warmed up and was a gray, cloudy, windy day with intermittent rain. So tired of gray days! But there are blessings on gray days too. 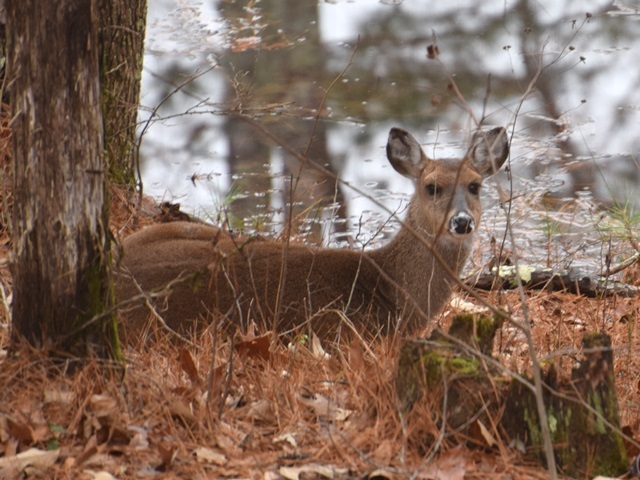 Looked out and we had a beautiful doe bedded down in the pine straw just off our bedroom deck, down by the pond. She was still there when we left for Tuscaloosa. So pretty. Last night coming home from Aunt Helen’s we saw a really big buck. He had the largest rack we have seen in a long time. Hope he survives hunting season. We had a quick breakfast with Jennifer and David and got ready to roll. Jennifer was not feeling well this morning, cold type symptoms, so say a prayer for her. We said our goodbyes and we all left about 8:15. On the road again!!! Only a short trip but we are in FRED. We had an uneventful drive to Tuscaloosa and are mooch camping in Mom’s driveway for the next two nights. Nancy was already at Mama Ruby’s house when we arrived. We started helping get things ready for tomorrow. We got some Christmas decorations out and worked on getting some Christmas spirit in various rooms of the house. Also started on some of the food preparations for tomorrow. 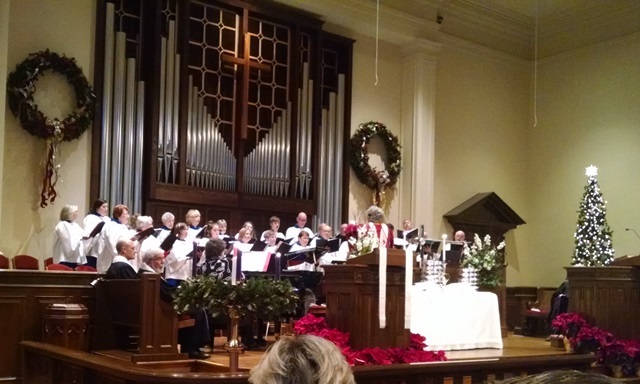 We left the house about 3:30 for the 4:00 pm Christmas Eve service at Tuscaloosa First United Methodist. It was a wonderful service and the sanctuary was packed. 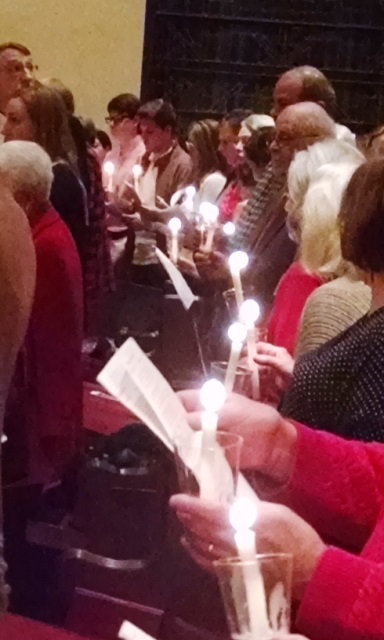 We sang carols, listened to the choir, and then a meditation by the pastor, had communion and closed with a candle light service. Really nice service. Afterwords we went back to Mama Ruby’s house, prepared dinner then returned Mama Ruby to to the assisted living. Tomorrow will be a busy day. A Quiet Christmas Eve, Eve. Today was cloudy and rainy. Hard rain for a while but it had all cleared out by lunch time. It remained cloudy and windy all day. It was quite warm this morning before the rain but afterward the temperature started dropping. Tomorrow night’s low is 28. Seventy degrees to 28. Yep, that’s Alabama weather. So, what did we do today. Max cooked Anne a wonderful omelet while David cook an equally wonderful one for Jenifer. Of course, they also cooked one for themselves. It’s been so nice to have David and Jenifer with us this Christmas. Such a sweet couple. We just sat around and talked while it rained this morning. Good times. Later we walked up to Aunt Helen’s, fixed lunch for Helen and Juno, visited with the rest of the family for a while then came back home to fix lunch for ourselves. This afternoon we started loading the few things we need in FRED for the next two days in Tuscaloosa for the Anne’s family Christmas. Just before dark it was another walk to Helen’s and a few rounds on the track for some additional exercise. For those wondering, we still haven’t unwinterized FRED. We may do that tomorrow after we park at Anne’s mom’s house. The weather this weekend will be okay but we are looking ahead to next weekend. If we unwinterize we may have to leave a little earlier than planned to avoid re-winterizing. We have postponed the decision until tomorrow. That’s it for today. Sorry no pictures. Everyone stay safe traveling for Christmas and please remember what we are celebrating. Author rvingwithapurposePosted on December 23, 2017 Leave a comment on A Quiet Christmas Eve, Eve. Today was cloudy all day with rain part of the day. No significant amount, but messy. The forecast is looking a lot better temperature wise and we may un-winterize tomorrow. We are going to have some 27-32 degree nights but FRED should be fine with that. We will check the forecasts again tomorrow before we make that decision. Today was a really nice day – inside – at our Armstrong family Christmas gathering held this year at Aunt Helen’s house. We had all the surviving members of Max’s Dad’s family present today for the first time in a long time. 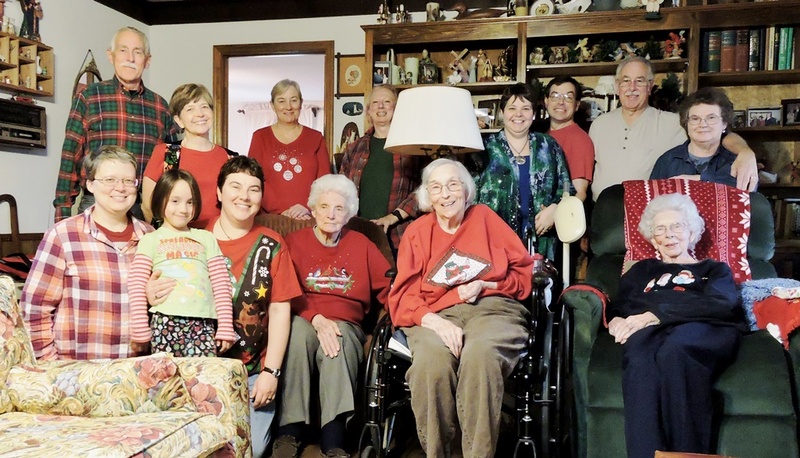 Fourteen total present with Aunt Jean being the oldest member of the family at 94, soon to be 95. We usually do not do the traditional Christmas dinner at this gathering and this year we had chili, vegetable soup, sweet potato biscuits with ham and several delicious desserts. There was lots of good food for everyone to enjoy and we spent the time visiting and having a good time. We brought small items to place in stockings for each other, but the true focus is time spent with family. Our LOL’s were all pretty tired by mid-afternoon but all seemed to have enjoyed themselves. Juno kept telling us this evening, “this was a really good day.” Their joy made it all worth while. We thank God for the blessing of time with our family. Author rvingwithapurposePosted on December 22, 2017 December 22, 2017 Leave a comment on GREAT FAMILY CHRISTMAS! It was a cloudy to partly sunny day with mild temperatures for this time of year. It’s actually looking much better with lows only at or slightly below freezing for the next week. We do have more rain for tomorrow and Saturday. And it doesn’t look like we will have a white Christmas. Oh, well. This morning we had to go back to Cullman for some tests. Trying to get all this done before the first of the year. Think there are two more doctor appointments next week and we will be done. We made hopefully our last trip to the stores and then back home and final preparation for the family to arrive. So thankful for safe travel for everyone. 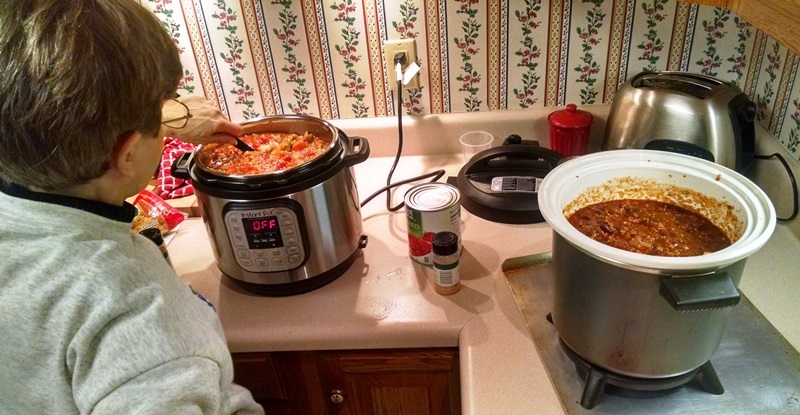 We have been cooking the soup and chili for tomorrow and looking forward to celebrating Christmas tomorrow with the Armstrong side of the family. Lots of good visiting this weekend. We were up early today to check the radar because we were scheduled to head to Tuscaloosa to see Mama Ruby. Last night the prognosticators were predicting rain with possible damaging storms. It rained most of the night and continued to rain this morning. However, the system was downgraded over night and the probability of damaging storms was much less. So, based on the movement we decided to wait until about 8:15 to depart. It rained really hard for about the first 30-40 minutes but the remainder of the drive was just cloudy. About lunch time we actually saw a little sunshine. We visited with Mama Ruby, took care of a lot of little things for her, had lunch with her and then took her to the beauty shop. Anne also got a hair cut. She really doesn’t like to have to get her hair cut when we are out of town so hopefully this will last until we return in February. On the way home we stopped at Aldi and Publix for some groceries – getting ready for the Christmas weekend. That’s it for today. 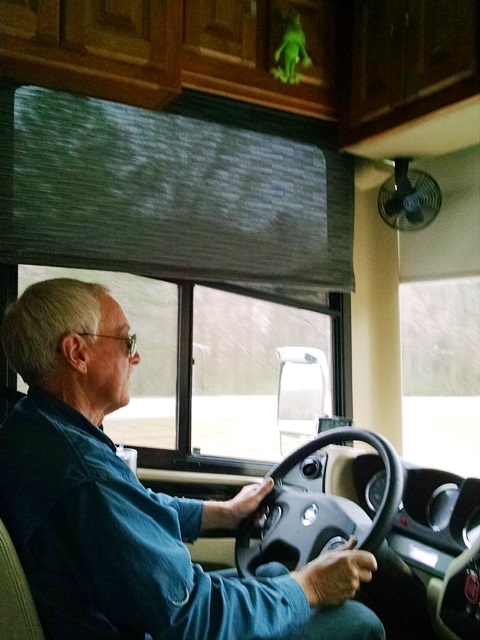 Please pray for safe travel for everyone traveling this holiday weekend. 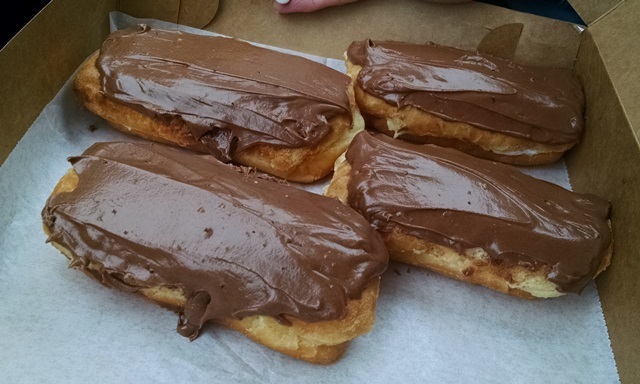 Yesterday was a foggy, cloudy day with nothing blog-worthy to talk about – so we didn’t. We just worked around the house and handled some business for the LOLs. Today was a rainy, cloudy, foggy, yucky day. As is usual for Alabama winters, the temperature goes up and we get rain. Stops raining and the temperature drops. The high was in the 60s today. 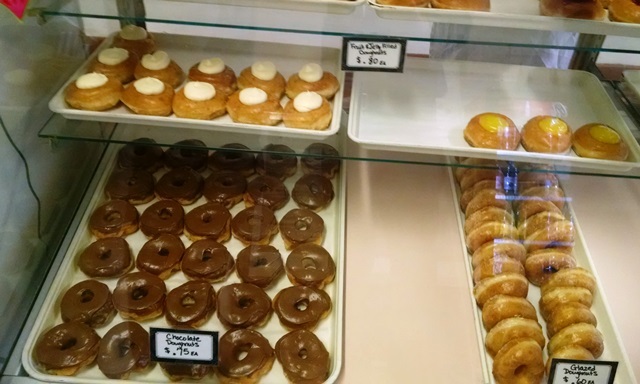 We had a doctor’s appointment in Cullman today and unfortunately, or maybe fortunately, the office is one block from The Duchess Bakery. 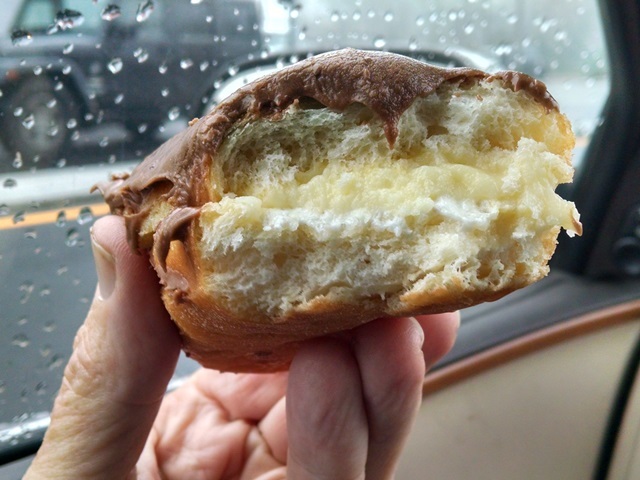 And we can never go there and not get their Bizmarks because rather than squeeze some filling into the pastry, they slice it open and fill it with both a layer of white cream and and a layer of custard filling and then ice with chocolate. So, we didn’t have a choice. 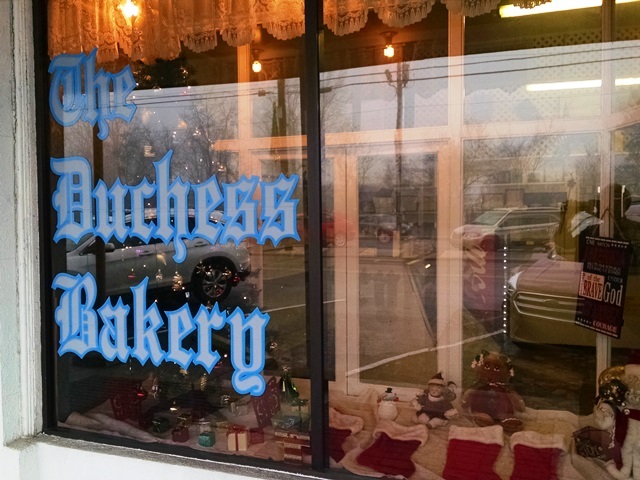 Duchess is one of the best, if not the best bakery in the state of Alabama. 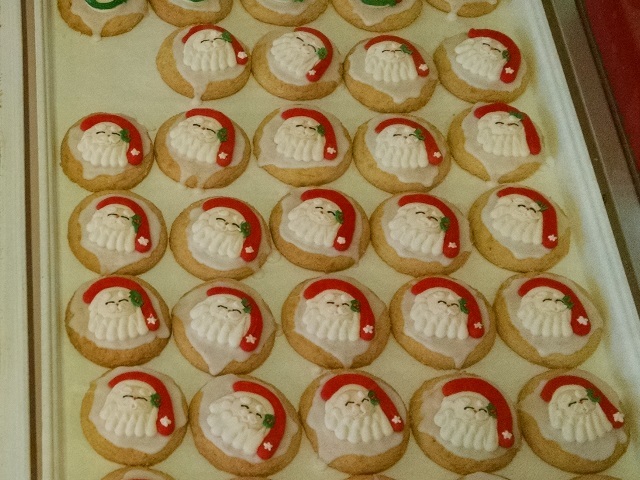 Of course, we had to have a Christmas cookie. They are so good. Today was a real Christmas splurge. The scale will not be happy in the morning. We really need to behave the next two days because Friday is the Armstrong Christmas get together. We know this is a RVing blog and we will be getting back to RVing soon, but for the next week we will be enjoying family time and completing our doctors visits and family business. Today was a gray, rainy day. The weather forecast is for more of the same. And also trending colder and wetter for the next 7 days. The weather man said we would have a couple for dry days, but they would be cold and that sunshine was not going to be very common. Oh, well. It’s winter. We were hoping to un-winterize FRED for Christmas and not have to re-winterize before heading south January 1st, but it’s looking like we may not be un-winterizing at all until we head south. Yuk!! We had lunch all ready and left for church at 8:00 this morning and just happened to notice as we were driving by Aunt Helen’s that there was no Visiting Angel car there. We swung around and pulled into the driveway and garage door was still down. Not a good sign. We let ourselves in and all the lights were still out and everyone was still in bed. No Angel anywhere in sight. Aunt Helen was awake but totally oblivious to the day or time. Juno was still sound asleep. We called the supervisor and of course got voice mail. So much for our plans to attend the Christmas music service this morning. We began getting the ladies up and dressed and fed. We did get a call back from the supervisor who didn’t know why there was no one on the job. 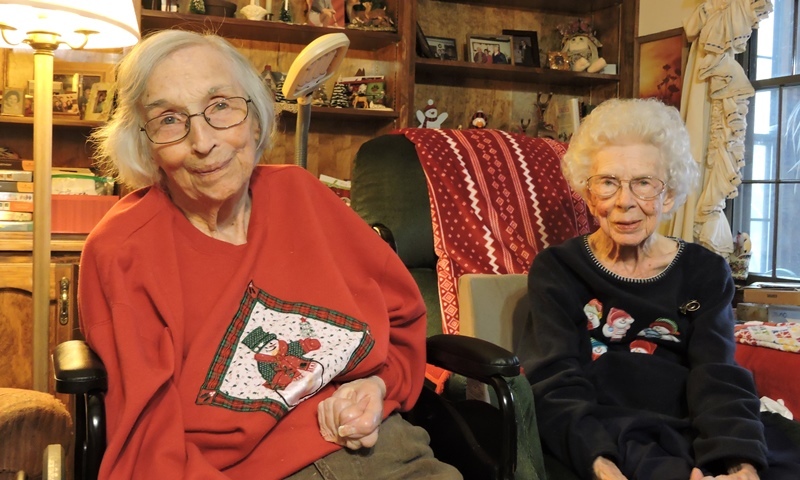 She called back later and said someone was on the way, but by then Helen was dressed, fed and chilling in her recliner and Juno was up doing her morning devotion. We couldn’t get to church anyway by then so we just told her to forget it, we would handle everything. We got Juno’s toast and Boost when she was ready and got the ladies on the way to church right on time. We then went back home, watched the video stream of our 11:00 service (where the Christmas music was done last week), and finished up lunch. Oh well, we turned on Christmas music and got to hear Barry’s sermon anyway. It was such a damp, gray day, after cleaning up after lunch at Helen’s, we came home a took a nap and watched another Christmas movie. Hope you all had a wonderful Sunday. Author rvingwithapurposePosted on December 17, 2017 Leave a comment on Plans – HA!